The Hotelo is located in the historic center of Lyon, on the Presqu’île, next to Place Carnot. It has guest rooms with private bathrooms, air-conditioning, satellite TV, Canal+ cable and free Wi-Fi. Guests of the Hotelo can enjoy a buffet breakfast in the hotel dining room and there are numerous restaurants within easy walking distance. Perranche Metro (subway) station has service throughout Lyon, while the TGV station offers trains to Paris and Marseille. Highways E15 and A6 can be accessed by car in a few minutes. Notre Dame de Fourvière and the Musée gallo-romain de Fourvière are just 1.5 miles from the Hotelo. La Tour Rose is in Lyon’s historic quarter, less than a 10 minute walk from the Notre Dame de Fourvière Basilica. It offers rooms, suites and apartments with free Wi-Fi access. All accommodations are air-conditioned with a TV and a private bathroom. Bathrobes and slippers are provided and some rooms overlook the interior grounds. The Tour Rose has a restaurant which serves both traditional French and international cuisine, prepared with fresh local ingredients. Meals can be served on the outdoor terraces in the warmer months. Guests can enjoy a wine or a cocktail in the lounge bar, where a daily breakfast is also served. La Tour Rose is just 270 yards from the Vieux Lyon Metro stop and the Musée gallo-romain de Fourvière is a 10-minute walk away. Private parking is available on reservation. In the historic quarter in central Lyon, this Hotel de Charme has original school-theme décor. It features an on-site bar and free minibars are provided on each floor. A flat-screen TV and free Wi-Fi are standard in each air-conditioned room. Guest rooms are decorated entirely in white and feature full-length lockers for storage. The private bathrooms include a hairdryer. Some rooms have a balcony and panoramic views of the city. Enjoy a drink in Baràgones Bar or on the terrace at Le Collège. A buffet breakfast is served in the dining room, which features original classroom-style furniture. Hôtel Le Collège is just 65 ft from the Gare de Lyon Saint-Paul Train station. Lyon Beaux-Arts Museum is a 6-minute walk away. Private parking is available on site. Le Phénix Hôtel is a 5 minute walk from Old Lyon, and 300 ft from Saint Paul Bus Station. It has a piano bar and offers air-conditioned accommodations with free Wi-Fi. Each room at the Phénix has a private bathroom and a flat-screen TV with satellite channels. Breakfast can be served to the guest rooms or in the dining room. Le Phénix Hôtel also provides a bar, 24-hour front desk and a car rental service. The Phénix is just 550 yards from the Musée des Beaux-Arts on Lyon’s Presqu’île. The Place Bellecour and Lyon’s Part-Dieu Train Station are a short metro ride away. This Bed in City residence offers en-suite apartments, each with a kitchen, TV and free Wi-Fi. It is located 300 metres from Debourg Metro station in Lyon. Apartments at the Bed In City Le Virgile have lift access and each kitchen has a refrigerator, microwave and electric hotplates. A laundry room, a cleaning service and a linen rental service are also available. 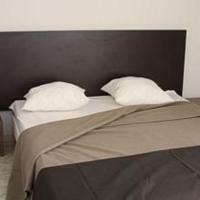 The residence also provides an airport shuttle and a bicycle rental service.The Bed In City Le Virgile is situated within walking distance of Lyon’s École Normale Supérieure and 2 km from the Cours Charlemagne. The Hôtel Foch is located in central Lyon, 330 ft from Foche Metro. Each room has a flat-screen TV, private bathroom, bathrobe and free Wi-Fi. Some rooms are air conditioned. Guests of the Foch can relax with a drink and a free newspaper in the hotel bar. The hotel also offers a continental breakfast and guests can select from a range of room service options. The Hôtel Foch is less than half a mile from Rue de Vendôme and guests can visit Lyon’s Nouvel Opera House, just half a mile from the hotel. This hotel is located on Lyon’s Presqu’île and offers an indoor swimming pool and rooms with flat-screen TVs and free Wi-Fi. It is located 650 ft from Place des Terreaux. Guest rooms at Grand Hôtel des Terreaux are decorated in a traditional style and have modern private bathrooms equipped with a hairdryer and a bathrobe and slippers. All rooms are serviced by an elevator. The hotel serves a buffet breakfast, which guests can enjoy in the dining room, or in their room upon request. The Grand Hôtel des Terreaux also has a bar where guests can relax with a drink in the evening. The hotel front desk is open 24 hours a day and free newspapers are available in the lobby area. The Hôtel des Terreaux is a 3-minute walk from Lyon’s Museum of Fine Arts. The nearest Metro Station is Hôtel de Ville, 1500 ft from the hotel. The Campanile Lyon Centre-Berges du Rhône has free Wi-Fi internet access. It is just 215 yards from the Guillotière Metro Station and the Rhône. The rooms at the Campanile are decorated in a simple style and feature air conditioning and an LCD TV. The private bathrooms are complete with a bathtub and a hairdryer. A breakfast buffet is served every morning at the hotel. Additional facilities include a 24-hour front desk, 2 meeting rooms and express check-in. The hotel is a 15-minute walk from Rue de la République, Lyon’s main shopping street and Place Bellecour. The A6 and A7 are a 5-minute drive away. Hotel Qualys is located on Lyon’s Presqu’île, 660 yards from Perrache TGV and Metro station. It has a culinary restaurant, a picturesque shaded terrace and a flower garden. Each of the guest rooms at the Hotel Qualys Axotel Perrache have a private bathroom, air-conditioning, satellite TV and free Wi-Fi. The Axotel Perrache serves a buffet breakfast. Guests can enjoy billiards or relax with a drink during the evenings in the hotel bar or on the terrace. Set in the heart of the city, the Hotel Qualys Axotel Perrache is just half a mile from Place Carnot and highway E15/A6. Vieux Lyon and Lyon Cathedral are 1.5 miles away. Inter-Hotel de la Loire offers affordable accommodations near the center of the city and historic quarter. It is a 5-minute walk from the Lyon Perrache train station and free Wi-Fi is available. Rooms at the Inter-Hotel de la Loire are spacious and soundproofed. They are all equipped with private bathrooms and satellite TV. Some of the rooms are air-conditioned. This Inter-Hotel is conveniently located near public transportation and stores, making it an ideal base for exploring Lyon. Best Western Lyon Saint-Antoine offers comfortable accommodations in the Presqu'ile district of Lyon. The rooms are soundproofed and free Wi-Fi is available throughout the hotel. Each Lyon Saint-Antoine room has a TV with cable or satellite channels and a fully equipped private bathroom. Best Western Lyon Saint-Antoine offers a continental breakfast and has a cocktail lounge where guests can enjoy a drink before dining at one of the nearby restaurants. A 24-hour front desk ensures that the hotel’s multilingual staff is available to assist guests at any time. Lyon Saint-Antoine’s 18th-century building is located between the Saone and Rhone Rivers, across the bridge from Vieux Lyon. It is just 440 yards from the Bellecour Metro station, making it easy to explore the city. Radisson Blu Hotel is in the center of Lyon, just 130 ft from Lyon Part Dieu Train and Metro Station. It has air-conditioned rooms with free Wi-Fi access and panoramic views of the city. Each room includes a TV with satellite channels, a minibar and a private bathroom with free toiletries, bathrobes and slippers. An international buffet breakfast is served daily for an additional fee. You can enjoy the region’s wines at “L’Arc En Ciel” gourmet restaurant, or brasserie-style cuisine at the “Bistrot De La Tour”. You may also enjoy a cocktail at “Le Ciel de Lyon” bar, on the 32nd floor. Radisson Blu is less than a 10-minute walk from Les Halles Paul Bocuse shopping center and guests have free access to Elixia fitness center, swimming pool and hammam, a 20-minute walk away. This Best Western hotel is in central Lyon, just over half a mile from the Lyon Part-Dieu TGV Train Station. It has a 24-hour front desk and bar, an interior garden and free Wi-Fi access. The Crequi Lyon provides modern, soundproof guest rooms and suites. They include air conditioning, a flat-screen satellite TV and a minibar. The Best Western Crequi Lyon Part-Dieu serves a daily buffet breakfast. Its restaurant, La Cantine du Palais, is open during the week and prepares traditional dishes using local produce. The hotel is only 500 ft from the Place Guichard metro station and 325 ft from the Palais de Justice Mairie Tram Stop. Private parking is available on site and Saint Exupery Airport is 12 miles away. Hotel Dubost is on Lyon's Peninsula. It is just 165 ft from Perrache Metro and SNCF Train Stations and half a mile from Place Bellecour. Guest rooms at Dubost come with a private bathroom, Wi-Fi internet access and satellite TV. They enjoy views of Place Carnot or the hotel’s courtyard. Dubost serves a daily breakfast which can be taken in the dining area or in the guest room upon request. Hotel Dubost is within easy access of the city’s restaurants, shops and sites. Vieux Lyon, Fourviere Basilica and the Roman ruins are just over 1 mile away. Located in Old Lyon, Cour Des Loges includes 4 restored Renaissance buildings set around a glass-roofed courtyard. It features 2 restaurants, a wine cellar and a luxury spa with a heated, counter-current swimming pool. Equipped with a flat-screen satellite TV and free Wi-Fi access, each air conditioned room at the Cour des Loges has unique decor with historic accents. Les Loges serves culinary cuisine using fresh, seasonal produce under the stone arches of the central courtyard. Café Epicerie serves dishes inspired by exotic spices and has a shaded terrace. Its delicatessen sells gourmet condiments and wines. The hotel's spa features massage treatment rooms, a sauna and a hammam. The fitness room has a range of exercise machines and free weights. Concierges are available 24 hours to assist with local sights and excursions. St Jean Cathedral is 1000 ft from the hotel. Vieux Lyon Metro Station is 1700 ft away. Le Roosevelt is located in the heart of central Lyon, a 10-minute walk from the opera and 3 stations from Place Bellecour. It offers free Wi-Fi internet access. The modern guest rooms are equipped with air conditioning, flat-screen satellite TV and private bathrooms including a bathtub. Hotel Le Roosevelt provides a daily buffet breakfast which can also be served in the guest room upon request. The hotel bar has a fireplace and includes a dedicated reading area. Foch Metro station is only 300 ft from Hotel Le Roosevelt, providing access to the city’s many sites. Bicycle rental services are 100 ft away, and car rental services are just a 15-minute walk from the hotel. Secure private parking is available arriving by car. La Résidence is on a pedestrian street on Presqu’ile, half a mile from Lyon’s historic district. It offers 24-hour front desk service and air conditioned rooms with satellite TV and free Wi-Fi access. Each soundproofed room is equipped with an iron and a minibar. Individual bathrooms have a hairdryer and bathtub or shower. A continental breakfast is served daily and can be delivered directly in guests’ rooms. The staff is available at all times to provide assistance with excursions and to give restaurant recommendations. A computer with free internet access is provided in the lobby area. La Résidence is just a 2-minute walk from the Place Bellecour and 900 ft from Ampère Victor Hugo Metro Station. Part Dieu Train Station is 2 miles away. The Laennec is 2.5 miles from Lyon’s Part-Dieu Train Station and a 5-minute walk from the Grange Blanche Metro and Tram stops. It offers 3-star accommodations and free Wi-Fi access. Rooms at the Laennec Hotel are equipped with a private bathroom and satellite TV. Breakfast is served in your room each morning. Private parking is available at the Laennec and highway A43 is less than a mile away. Old Lyon and the center of the city are just a 10-minute metro ride from the hotel. It is also in the heart of the hospital district. This Park & Suites residence is in a 1930s building and features a spa area with a hot tub and sauna. It is in Lyon's Part-Dieu business district, just a 10 minute walk from the TGV train station. Suites are air conditioned and equipped with a flat-screen satellite TV. They each have a kitchenette with a microwave and dishwasher. The Lyon Part-Dieu provides a daily buffet breakfast or a continental breakfast, which can also be taken in the guest room upon request. Guests can also choose to have a drink in the bar before dining in the restaurant, both in the atrium Garibaldi and Sans-Souci Metro stations are both less than half a mile away. They provide access to Place Bellecour and Notre-Dame de Fourviere Basilica. Au Patio Morand is a 15-minute walk from Lyon’s Tete d’Or Park and 820 ft from the Foche Metro stop. It offers air conditioned accommodations set around a flowered patio. Rooms at the Morand have free Wi-Fi, a private bathroom and a plasma-screen TV with satellite channels. A breakfast buffet is served daily and guests can enjoy their meal on the patio during the summer. The Patio Morand also provides a 24-hour front desk and free newspapers. The Morand is a 10-minute walk from the Les Halles Paul Bocuse Tram stop and one mile from Lyon’s Part-Dieu Train Station. The Place Bellecour and Old Lyon are one mile away. This hotel is in central Lyon, in the Croix Rousse area. It is 330 ft from the Hénon Metro station and offers an underground parking garage and free Wi-Fi. Each soundproofed room at the Kyriad Hotel Lyon Centre Croix Rousse is equipped with air conditioning, a flat-screen TV with satellite channels and tea and coffee making facilities. Guests can enjoy a daily buffet breakfast, in the dining room or on the outdoor terrace. Guests are also invited to enjoy a drink in the bar. The hotel reception is open 24 hours a day. Vieux Lyon (the historic quarter) is one mile from the Kyriad Hotel Lyon Centre and Place Bellecour is 2 miles away. The Richelieu is in Lyon's business district, a 5-minute walk from Lyon-Part-Dieu TGV Station. It offers soundproofed rooms with lift access, flat-screen TV with Canal + cable channels and free Wi-Fi. The hotel Richelieu serves a continental breakfast every morning in the hotel dining room. Guests can relax with a drink in the bar and chose from a variety of room service snacks 24 hours a day. Richelieu is a 10-minute walk from the Parc de la Tete d'Or and a 10-minute drive from the Cite Internationale and the conference center. Brotteaux Metro Station is 919 ft from the hotel. This hotel in the 6th district of Lyon offers comfortable accommodation, just an 8-minute walk from the Tête d’Or Park. It is situated 1.7 km from La Part Dieu Train Station. 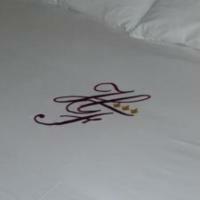 Guest rooms at Hôtel Tête d'or are fitted with a large double bed and equipped with a colour TV and free Wi-Fi access. Each room features a private bathroom. There are many restaurants and cafés within 500 metres of the Hôtel Tête d'or, and a buffet breakfast is served every morning in the breakfast room. There is a 24-hour reception in the hotel, and the Cité Internationale is just a 5-minute drive away. Lyon Metropole Resort, Residence & Spa has a spa area with 26,900 ft² of hot tubs, saunas and an indoor swimming pool in this 4-star hotel. It is on the banks of the Saône River and also has an Olympic-size outdoor pool. Views of the river or the swimming pool are available from the contemporary-style accommodations at Hôtel Lyon Metropole & Spa. All rooms and suites have an LCD TV and some have a sitting area. A buffet breakfast is served every morning at Lyon Metropole. French and healthy-eating options are available on the marine-style restaurant’s terrace, and the bar has a large champagne and whiskey list. Free Wi-Fi, 4 tennis courts and an on-site hair salon are just some of the other services available at the hotel. Central Lyon is 2 miles from the hotel. Public parking is available on site and Cuire Metro Station is a 20-minute walk away. Bus number 40 stops in front of the hotel and has direct access to the center of the city in 10 minutes. Adagio Access Lyon Mermoz is in the 8th district in Lyon, across from the Maison de la Danse Theatre. It offers soundproof apartments with air conditioning, free Wi-Fi and satellite TV. Each apartment at the Adagio Access Lyon Mermoz has a private bathroom and a kitchenette equipped with a fridge, microwave and hotplate. Breakfast is served daily in the Adagio Access Lyon Mermoz’s breakfast room. The residence also provides laundry facilities and a private, secure parking lot. The Adagio Access Lyon Mermoz is just a short Metro ride from the Place Bellecour on the Presqu’ile and the Vieux Lyon district. It is a 10-minute drive from La Part Dieu Train Station. Bayard is on Place Bellecour, a 5-minute walk from Vieux Lyon. It offers contemporary rooms with free Wi-Fi access and an LCD TV. Rooms at Bayard Bellecour are individually decorated and offer a private bathroom. Some feature traditional-French prints and views of Place Bellecour. A continental breakfast of fresh pastries and hot coffee is served every morning in the breakfast room. 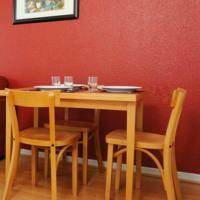 Guests can also choose to dine in the comfort of their room. The hotel is across from Bellecour Metro Station and half a mile from Lyon Parrache Train Station. Notre Dame Basilica is located on Fourviere hill and is one mile from Bayard. This residence is a 5-minute walk from Gorge de Loup Metro station in Lyon. It offers soundproofed accommodations with free wired internet access and a plasma-screen TV with DVD player. Studios and apartments have a private bathroom, a kitchen equipped with a microwave and a coffee maker. The 2-room apartments at the Lyon Park Lane are serviced by an elevator and feature a private balcony. A breakfast buffet is served daily and the Sejours & Affaires Lyon Park Lane also offers a laundry service. The Séjours & Affaires is just one Metro stop from Vieux Lyon and 2 stops from the Place Bellecour. It has on-site parking and the Lyon Parrache Train Station is 2 miles away. Hotel du Dauphin is a 2-star hotel located in Lyon on Place Bellecour. It offers en suite rooms with satellite TV and free Wi-Fi internet access. Some have a balcony. Breakfast is served daily at the Hotel Dauphin. Room service is available until 12:00. The Hotel Dauphin also has a free luggage drop. Next to Lyon Perrache TGV Train Station and a 10-minute walk from Place Bellecour is this 4-star hotel. A listed Art Nouveau building, it has a 24-hour front desk featuring wall paintings. Period furniture feature in the rooms at Mercure Lyon Centre Château Perrache. All accommodations have an LCD TV and free Wi-Fi access. Guests can admire the original decoration over Mercure Lyon Centre Château Perrache’s buffet breakfast or traditional dishes. There is also the Riviera Express bar, which has light snacks and drinks. Free outdoor parking is available at the hotel and covered, private parking is also possible for an additional fee. The center of Lyon is just a 5-minute walk away. Hotel de Noailles is located on the left bank of Old Lyon, in the center of the city near Saxe Gambetta Metro Station. It offers rooms overlooking the courtyard or the grounds. The air conditioned guest rooms at Hotel de Noailles are soundproofed, and feature a private bathroom. Each room is equipped with a TV and free Wi-Fi access. Breakfast is served daily and snacks are available at the Hotel de Noailles. Garage parking is available and all of the rooms are in the back of the hotel to avoid street noise. Noailles Hotel is located between the peninsula and Part Dieu Train Station, which is a 7-minute drive away. In the heart of Lyon, this 5-star hotel is just a quarter mile from Place Bellecour with its luxury boutiques. It features a fitness center, hammam and a beauty salon. The air-conditioned guest rooms and suites at the Sofitel come with a minibar, TV with satellite channels and free Wi-Fi. Some of the contemporary rooms feature views of the River Rhône and a living room. The Michelin-starred on-site restaurant, Les Trois Domes, offers gourmet meals and panoramic views of the city, and Le Silk restaurant serves traditional French dishes. The Melhor bar offers city views and displays the interactive cocktail menu on an iPad. With a 24-hour front desk, guests can relax in the lounge area featuring unique flower motifs on the wall. The hotel is less than half a mile from Bellecour Metro Station and the Fine Art Museum is one mile away. The historic district is one mile away. The Alexandra Hotel is located in historic downtown Lyon near the pedestrian streets. It offers rooms with free Wi-Fi internet access and most with private bathrooms. The hotel offers quiet accommodations in a peaceful area near the train station, and Place Bellecour, an area well-known for its numerous local restaurants known as Bouchons. All rooms are serviced by an elevator. Breakfast is served daily at the Hotel Alexandra and private parking is available upon reservation only. Hotel Alexandra is 2-minute walk to Ampère Victor Hugo Metro Station and just a 10-minute walk to Place Bellecour. This 4-star hotel is in Lyon, on the banks of Rhône River, just under a quarter of a mile from the Halle Tony Garnier concert venue. It features an outdoor pool with terrace, free Wi-Fi and meeting facilities. The air-conditioned guest rooms at the Novotel Lyon Gerland have modern décor and feature a flat-screen TV, a safe and a minibar. All rooms have facilities for making tea and coffee and the suites also have Nespresso coffee machine. The Novotel Café provides a daily buffet breakfast in its dining area, or a continental breakfast in guests’ rooms. The hotel restaurant serves a range of French dishes and guests can also enjoy a variety of snacks at the bar. Debourg Metro Station is a 10-minute walk from the hotel providing direct access to Lyon Part-Dieu Train Station. Old Lyon is 3 miles from the hotel and Stade de Gerland is just over 1 mile away. A fitness room is also available at the hotel. In central Lyon, this Mercure hotel is just over half a mile from Part-Dieu TGV Train Station. It has air-conditioned guest rooms with satellite TV, free Wi-Fi access and a fitness room with an indoor swimming pool. 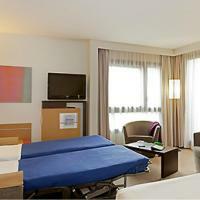 Rooms at Mercure Lyon Saxe Lafayette are decorated in a contemporary style and feature a minibar. A full breakfast is served daily in Le Garage restaurant which also serves a range of regional dishes for lunch and dinner. Le Saxe bar serves aperitifs and cocktails, where guests can relax in one of the armchairs. Saxe Lafayette is just over 1 mile from Place Bellecour and 325 ft from Palais de Justice Tram Stop. The hotel is accessible from the highway A6 (5 minutes away) and private parking is available on site. Première Classe Lyon Centre Gare Part Dieu offers air-conditioned accommodation 440 yards from the Lyon Part-Dieu Station. It is near easy access to public transportation and offers free Wi-Fi and on-site parking. Guest rooms at this Premiere Classe hotel include a TV, work desk and private bathrooms with a shower. All rooms are accessible with elevator and can accommodate a children's crib. A buffet breakfast can be enjoyed every morning before exploring Lyon. It is just EUR 2.75 for children up to 10 years old. 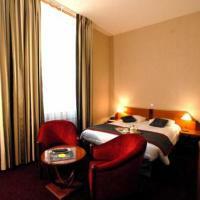 Première Classe Lyon Centre Gare Part Dieu is conveniently situated next to Part Dieu shopping mall. It is a 10 minute metro or bus ride from Vieux Lyon and 25.6 miles from Lyon Saint-Exupéry Airport. Centrally located, Hôtel Le Royal Lyon - MGallery Collection is just a 10-minute walk from the historic quarter. It features a lounge bar with views of the Place Bellecour. All the rooms at Hôtel Le Royal Lyon have a private bathroom and a satellite TV. Guests have access to free Wi-Fi and bathrobes and slippers are provided. Guests are invited to enjoy a drink in the Cote Bellecour bar and listen to music. Next to Bellecour Metro station, Hôtel Le Royal Lyon - MGallery Collection is a 15-minute walk from the Musee des Beaux-Arts and the Saint-Jean Cathedral. The La Part-Dieu Train Station is 2.5 miles away. In central Lyon, this Best Western hotel has modern rooms and suites with a view of the Fourvière hill in the historic part of the city. All guest rooms at the Hotel du Pont Wilson are stylishly decorated, each with a different color scheme. Rooms come equipped with free Wi-Fi access and Satellite TV, and are serviced by an elevator. Each of the white-tile private bathrooms includes a hairdryer. A buffet breakfast is served daily at the Hotel du Pont Wilson in the elegant restaurant, or can be served in the privacy of the guest room. Hotel du Pont Wilson is across from the Presqu’ile, where guests can visit the Musee des Beaux Arts. It is just 165 ft from the Liberté Tram Stop, and is a 15-minute walk from Part-Dieu Train Station. Private parking is available on site for an extra fee. On Lyon’s Presqu’île in a 19th century building, this Mercure hotel is a short walk from historic Lyon. The hotel offers air conditioned rooms with free Wi-Fi and bar. 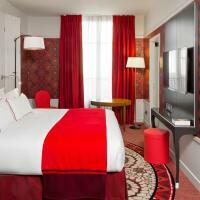 Guest rooms at the Mercure Lyon Beaux-Arts are simple furnished and come with satellite TV and a minibar. Each room has a private bathroom with a bathtub and all rooms are serviced by an elevator. Breakfast is served each morning in the breakfast room or in guests’ rooms upon request. The hotel has a bar in the lobby where guests are invited to relax with a drink in the evening. The front desk at the Mercure Lyon Beaux-Arts is open 24 hours a day. Additional facilities available at the hotel include free newspapers and baggage storage. Bellecour Metro Station is 1000 ft from the hotel. The Musée des Beaux Arts is a 10-minute walk away. Just 650 ft from Sans Souci Metro stop, this Mercure hotel is a 10-minute Metro ride from the center of Lyon and the Part-Dieu Train Station. It offers stylish rooms with a movie theme. Each air conditioned room at the Mercure Lyon Lumière has free Wi-Fi, satellite TV, tea and coffee making facilities and a private bathroom. All rooms are accessible with an elevator. A buffet breakfast is served daily at the Lumière and the Le Cinematograph style restaurant serves traditional and regional cuisine. Guests can enjoy a drink at the hotel’s bar. The Lumiere has an underground private parking lot and it is 5 minutes from the Maison des Frères Lumière and the Manufacture des Tabacs. Edouard Herriot Hospital is 10 minutes away. On Lyon’s Presqu’ile, this Mercure hotel is in the center of the city and a 10-minute walk from Old Lyon. It has soundproof accommodations with air conditioning and free Wi-Fi internet access. Guest rooms at the Mercure Lyon Plaza République are contemporary in style and equipped with satellite TV, a minibar and tea and coffee-making facilities. The private bathrooms have a bathtub and a hairdryer. A buffet breakfast is served daily and in the evenings guests are invited to relax in the hotel’s Plaza Bar. The front desk is open 24 hours a day and free newspapers are available in the lobby. The Lyon Plaza Hotel is just a quarter mile from the Cordeliers Metro and bus stops. From here, guests have direct access to the Part-Dieu Train Station. The hotel is a 15-minute walk from Lyon Fine Arts museum. This Novotel is located on the forecourt of La Part-Dieu Train Station, in central Lyon. Close to the conference center and shopping center, it offers soundproofed accommodations with air conditioning. Each guest room at the Novotel Lyon is equipped with free Wi-Fi, a flat-screen TV and satellite channels. There is a daily buffet breakfast and the Novotel Café serves traditional French cuisine and regional specialties. Guests are invited to relax in the bar and snacks can be served throughout the day. The Novotel La Part Dieu is an environmentally certified hotel with Green Globe. It is situated 1 mile from the Rhône River. Hotel Du Parc is located in central Lyon, 480 yards from Massena Metro Station and a 10-minute walk from Lyon Part-Dieu Train Station. It offers rooms with free Wi-Fi. The soundproofed guest rooms are equipped with air conditioning, flat-screen cable TV and a private bathroom. Hotel Du Parc offers a daily breakfast which can also be served in the guest room upon request. In addition to a 24-hour front desk, Parc hotel also provides a laundry and dry cleaning service. Hotel Du Parc is within easy access of the new and old towns. The Parc de la Tete d’Or is half a mile from the hotel and the Espace Tete d’Or Exhibition Centre is 440 yards away. This Sejours & Affaires residence is in the Gerland area of Lyon, with Jean Jaures Metro Station at the foot of the hotel. It offers apartment accommodations with free Wi-Fi. Each apartment is equipped with a private bathroom, a sitting area with satellite TV and a kitchenette. Sejours & Affaires Lyon Park Avenue serves a buffet breakfast every morning. On-site private parking and laundry facilities are also available. The Halle Tony Garnier Exhibition Center and the Gerland Stadium are each one mile from the Lyon Park Avenue residence. Lyon Saint-Exupery Airport is 12 miles away. On the banks of the River Rhône, this designer hotel is beside Tête d'Or Park. It offers contemporary rooms with free Wi-Fi. Some feature panoramic views of the river. The air-conditioned guest rooms come with a flat-screen TV and a minibar. Some rooms feature a sitting area and a CD player. Each room has a private bathroom with amenities and a hairdryer. Free Wi-Fi is available throughout Hôtel de la Cité – Concorde Lyon. La Scène restaurant serves seasonal cuisine, made with local products. A buffet breakfast is served every morning, and guests can eat on the terrace on nice days. The Backstage Bar is open from 8:30 am until 12 am. Room service is available 24 hours per day. With public parking on site, the hotel is accessible via the A 42 highway. The bus stop outside the hotel provides direct access to central Lyon, 2 miles away. Hotel De Verdun is located in central Lyon on the Presqu’Ile, 492 yards from the Lyon Perrache TGV Train Station. It offers rooms with private bathrooms with satellite TV and Wi-Fi. Set within a former 1930’s private mansion, Best Western Hotel De Verdun provides a daily buffet breakfast. There is also a bar where guests can relax with a pre-dinner drink or read the free newspapers. 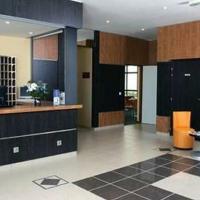 Best Western Hotel De Verdun has a 24-hour front desk and security guard. Guests have easy access to the city’s many shops and restaurants. Place Bellecour is a 10 minute walk away and Vieux Lyon is 1.3 miles from the hotel. Les Carrés Pégase is in the city of Lyon, only a few steps from the Perrache train station and the center of the city. It offers studio and duplex apartments for up to 5 guests. All of the apartments at Les Carrés Pégase have a kitchenette, a private shower, bed linens and towels, flat-screen TV with Canal+ cable and Wi-Fi internet access. The reception at Les Carrés Pégase is open 7 days a week. Breakfast is served daily and a range of hotel-style services is available. Les Carrés Pégase is a tourist residence located near the Rhone River in Lyon’s 7th arrondissement (district) which is served by Metro Lines B and D. From the hotel you are a short walk from the Université Lumière – Lyon II and Institute d’Etudes Politiques (IEP). Offering air-conditioned guest rooms with free Wi-Fi, this Mercure hotel is just a 10 minute walk from Lyon Part-Dieu Train Station. The modern guest rooms at Mercure Lyon Brotteaux are each equipped with a flat-screen TV with satellite channels and tea and coffee-making facilities. All rooms are serviced by an elevator and feature a private bathroom. A continental breakfast is served each morning in Lyon Brotteaux’s breakfast room or in guests’ rooms upon request. Room service for drinks and snacks is also available. The hotel’s front desk is open 24 hours a day and additional facilities available include free newspapers and luggage storage. Brotteaux Metro Station is a 2 minute walk from the hotel and Old Lyon is 1.5 miles away. Public parking is available for an extra charge just 55 yards from the hotel. This Hilton features air-conditioned rooms next to the Rhone River and the Tete d’Or Park. It is housed within the Cite International complex that includes a casino, fitness center and a hot tub. Flat-screen TV, a tea and coffee maker and a radio with an MP3 connection are available in all rooms. Private bathrooms come with bathrobes, slippers and Crabtree & Evelyn amenities. A buffet breakfast is available daily. Thai cuisine is the specialty of the Blue Elephant restaurant. French dishes and wines can be enjoyed at La Brasserie, which features an outdoor terrace. Guests can also try a cocktail in Spark Bar. Free Wi-Fi access is available in the lobby and in the 2 restaurants. Central Lyon is only a 10-minute drive away, and the Palais des Congrès is a few feet away. The hotel is a 30-minute drive from Lyon Saint-Exupéry Airport. Residhotel Lyon Part Dieu is in the heart of the business district, less than half a mile from Gare de la Part-Dieu Train Station and the airport shuttle stop. It offers spacious apartments and free Wi-Fi access. A full kitchenette, sitting area and satellite TV feature in all apartments at Residhotel Lyon Part Dieu. Each is air-conditioned and soundproof. All apartments are serviced by an elevator. The residence offers guests a daily continental breakfast. The front desk is open 24/7 with dry cleaning and laundry services that can be requested. Residhotel Lyon Part Dieu is just over a quarter mile from Rue Garibaldi. Metro Garibaldi is less than half a mile from the hotel and can take guests to central Lyon, which is one mile away.